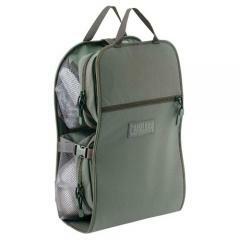 Keep important gear organized and accessible with the MedBak Medical Supply Pack Insert for BFM Packs from CamelBak. Designed to provide users with convenient and immediate access to vital medical equipment, this carrier features both an ergonomic pocket layout and a ruggedized construction. Its clamshell style opening lays flat to allow users to see and retrieve items with lightning quick efficiency. No more blindly rummaging through dark packs in search of gauze while a fellow warrior bleeds out. Two color-coded circulation and airway trauma packs are instantly identifiable, allowing medics to immediately remove the items needed for the most life threatening injuries. Additional mesh pouches are perfect for storing gauze, bandages and other items. To help organize paperwork and documentation, a slat pocket is built into the pack. The MedBak functions as a standalone medical organizer or can be integrated into BFM pack systems.